With the light weight, easy to use CleverShade 4WD awning there is no excuse for being caught without shade again. So we’ve all been in the situation where we check the incredibly reliable *cough* weather forecast, pack up the 4WD for a day at the beach or bush, not worry about an umbrella (since the weather forecast said we wouldn’t need it) only to have it be a lot more sunny or rainy than we had anticipated and you’re left either roasted or soaking wet. This isn’t a problem anymore! Wherever you go you can keep your light (approx. 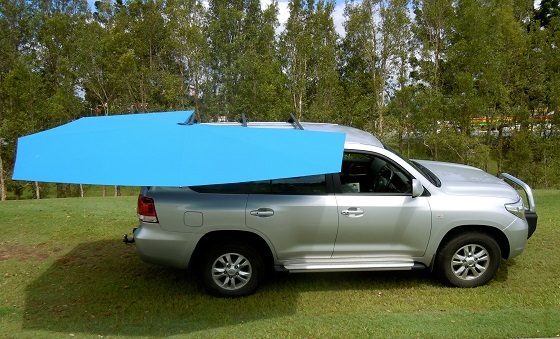 15.5kg) CleverShade 4WD awning on the roof of your 4WD so you’re covered no matter what Mother Nature throws at you. The best part is you don’t need any poles, pegs or rope to secure it in place. Simply lock in one side, fan it out, lock in the other side and you’re covered in less time than it takes to put the kettle on. Most of all, with portable vehicle shade this lightweight and durable, you’ll have no worries on the move ever again. Available in either a 180° model to cover the side of your car or a 270° model to cover the side and back of your car to ensure no matter what your shade requirements are, we will keep you covered. We’ve supplied to happy customers all over the world for many years. If you need something a bit different for your vehicle, we can work something out. 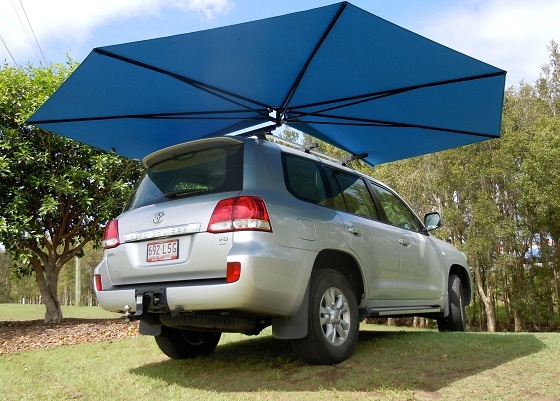 In addition, if you have any questions or would like to order a CleverShade 4WD awning of your own, give us a call. Another option is to fill in the contact form below and we will get back to you ASAP.